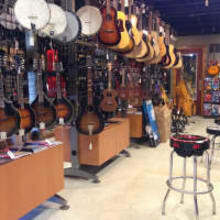 For over 20 years, Atlanta GA's leading music store with second to none customer service and the largest selection of world percussion in the Southeastern US. Most items ship via FedEx. Certain items may ship USPS at our discretion. Over-sized packages may result in additional shipping charges. If an item was damaged during shipping, a shipping claim must be filed within 24 hours of delivery. Be aware that shipping damage claims require thorough documentation and YOU are the one with the item. So...Please retain ALL packing materials AND photograph the item as it arrived. If the box appears damaged, start taking pictures before you open it! We value your business and strive to provide good service, products and communication. If you have any concerns about your order, please contact us prior to leaving feedback. We will photograph and describe all items to the best of our ability to avoid any miscommunication, so please ask any questions you may have prior to purchasing. If you are not satisfied with a Used or Vintage item it may be returned for a full refund (less shipping and handling charges). Buyer must notify us within 7 days of receipt that you want to return the item. Item must be returned in the same condition it was received or a restocking fee will be charged. New gear may be returned for a refund. Be aware we will deduct a 20% Restocking fee unless certain conditions (see below) are met. New Items must be returned in the same condition as sold. For example if an item was purchased new in the factory sealed box, it must be returned new in the factory sealed box. If a new item has been used or played it is NOT eligible for a full refund and the 20% restocking fee WILL apply. All Returns must be sent back with RA#, tracking and insurance, within 14 days. The following items are returnable only if defective OR unopened or unused: strings, reeds, computers, tubes, earbuds, earplugs, recorders, tin whistles, flutophones, "world" wind instruments, harmonicas, raw-frame speakers, drum heads, drumsticks, turntable cartridges, fog fluid, clothing/footwear, sheet music, cleaners, polishes, and polishing cloths. Software/soundware, cassettes, books, CDs, DVDs, and videos may be returned for credit only if they are in their original, sealed packaging. A Return Authorization is needed to return any item to our store for any reason. Please contact us prior to returning any item. We will issue an RA# to process your return. Claims & Warranties All new items will carry the manufacturer's warranty. Contact the manufacturer or distributor on new, defective items for directions on how to proceed. We do not ship outside the USA. Earthshaking Music Inc. reserves the right to refuse return for any reason.